Anchoring your 33 to 38-foot boat in soft bottoms is a piece of cake with the Fortress FX-16 anchor. The light weight and strong holding ability makes the Fortress the perfect anchor to hold your boat in place without adding a lot of weight to your bow or taking up a sizeable chunk of your boat’s real estate. Easy adjustability makes the Fortress FX-16 versatile enough for either sandy bottoms or muddy ones. The two sharp, pivoting flukes grab hard and hold tight. What is missing in weight is made up for in gripping power. While this is designed for boats up to 38 feet, the lightweight structure poses no burden on smaller craft, too. The deceptively strong anchor proves a reliable tool for keeping you in place even if the current is fast or the winds strong. 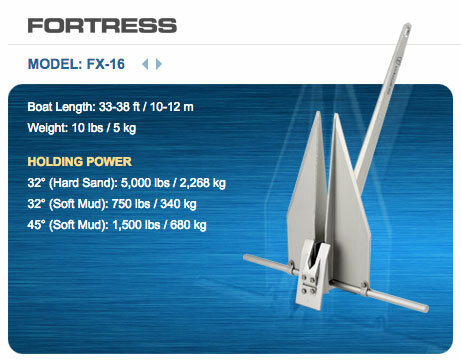 You can enjoy your favorite fishing hole longer when the Fortress FX-16 sets on the first try. When it’s time to pull up, you won’t break your back by hoisting a heavy steel unit. Windlasses and winches need not apply for this job. The Fortress is as light as it is tough. Made from high-tensile aluminum-magnesium alloy for strength that never rusts and doesn’t weigh down your bow. No welds. So it has no weak spots in the metal subject to breaking. Two pivoting flukes. These adjust to find the right bite at the right time. Two shank angles, 32 degrees for sand and 45 degrees for soft mud. Setting these is a simple task. Anodized and interlocking components, machined to fit and resist corrosion. The various parts won’t deteriorate as the anchor ages. Easily disassembled for storage. Optional storage pouch to keep it all out of the way. Lightweight and takes up very little room. You don’t need mechanical help to lift this anchor. Women, youngsters and inexperienced guests can handle the duty with little exertion. Easy to use. Set the proper angle for either sandy or muddy bottom conditions, lower and set. Often, it will grab on the first try, especially if used with a chain. Sets reliably. The reliability saves a lot of time so you can commence fishing while the fish are still biting. Safe. Even children can use it. Securely holds the boat. Once set, it holds tight even with a lot of drift in rough waters. Pulls up with ease. Because it only weighs about seventeen pounds, you don’t need a windlass, winch or a particularly strong back. Holds in strong currents and winds. Stores nicely in optional pouch. Lifetime parts replacement warranty and no-questions-asked policy when replacing damaged parts. Doesn’t work well on rocky bottoms. The sharp flukes are best suited for soft bottoms. Doesn’t work well on weedy bottoms. It tends to simply drag through weeds without setting. May work too well on muddy bottoms. Clay or compacted mud may not release the anchor, necessitating a dive. When it sticks too well it’s difficult to loosen and can end up as bottom debris. The Fortress FX-16 anchor is an amazing piece of equipment. The super pointed design of the flukes give it the ability to dig deep into sand, mud and clay, then hold for as long as you like. It tends to set quickly, so you spend a lot less time fooling with the anchor and more time fishing. Because of the aluminum alloy construction, the anchor is about half the weight of a similarly sized steel anchor. Yet it digs in as well as, if not better than, any steel anchor. The lightweight feature is perfect for those who can’t readily handle a regular heavy anchor. It’s easy to drop and just as easy to haul back up. Even children can wrangle the anchor without much difficulty or needing to use a windlass or winch. Your back will love you if you buy a Fortress anchor. Sometimes, however, it can stick too well in mud or clay. If it doesn’t come loose, you may end up cutting the line and leaving it behind. That’s a sad moment considering these are not the cheapest anchors you could buy. Also, the aluminum-magnesium metal won’t rust, ever. Plus, assembly hardware is anodized and rust/corrosion resistant along with the rest of the anchor. Once disassembled, it fits nicely into an optional storage pouch, taking up very little space on board. The FX-16 design, size and weight work very well for boats up to 38 feet regardless of the wind conditions and currents. You'll still need a different style of anchor for rocky or weedy bottoms, though. The Fortress flukes have a hard time managing a grip in those bottom conditions. It will slide over hard rocks and tend to slip through weeds. But for an overall useful anchor that's easy to deploy, strong and reliable, the Fortress FX-16 should find pride of place in the repertoire of your favorite anchors. Read more reviews on Amazon.